Italy holidays are all about parlour windows sprinkled with candy-coloured gelato, deliciously oversized pizza slices and designer shops, but there's plenty more to see in this famous boot. Our incredible holiday deals mean you can bag city breaks to Rome, Milan, Florence and other Italian hot spots for less than £150pp - bellissimo! These spectacular cities are perfect whether you're planning a romantic weekend break, fun family trip or solo holiday full of sun and sights - and at such a steal, there's even more excuse to set off as soon as possible! If spectacular architecture, vibrant art and chic town sqaures are your scene, then Rome is a superb city break for you. The Eternal City's historical sites dominate the skyline with must-see monuments including the open-air museum and famous Coloseum, while the cobbled streets of Centro Storico host more of the capital's main attractions. Wander along the Tiber, hit the high-end stores in Via Condotti and lose yourself in bustling markets by day, before fine dining in the city's pretty Piazza's when evening falls. This cosmopolitan city is full of beautiful buildings, classy wine bars and high-end boutiques, so it's sure to suit those who enjoy travelling in style. If you're keen on culture, sitting proudly in the centre is the picturesque Milan Duomo (you can't miss it), while those who want to appreciate the country's natural beauty can venture out of the city towards the Italian Lakes. Of course, no trip is complete without a visit to The Galleria Vittorio Emanuele Mall - so be sure to have your purse in hand! 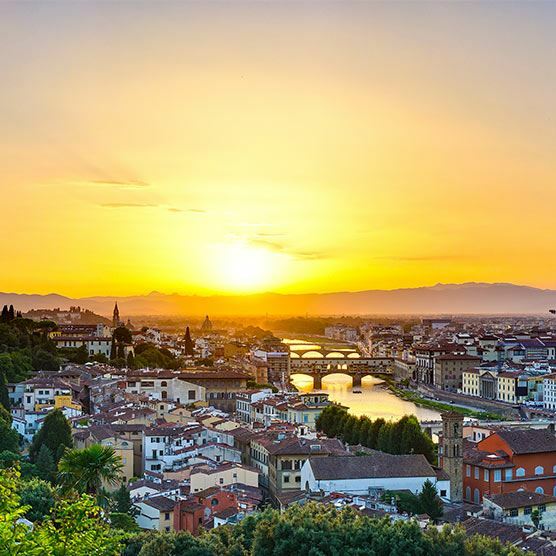 Set in the heart of Tuscany, the idyllic captial of Florence oozes tradition charm, tasty cuisine and a treasure trove of monuments, so you'll have plenty to see and do while you're here. Potter along the Ponte Vecchio Bridge and admire panoramic views over the Arno River, or hop on a gondola for a closer look. Art and history lovers can discover the Renaissance Era with a visit to the city's must-see galleries before soaking up the Florentine atmosphere in upbeat bars and alfresco restaurants when sunset falls.